Sometimes these short-season awards can be difficult to vote for. Yesterday, Andrew Cabezas was named the short-season Pitcher of the Year. Today we discuss the short-season Hitters of the Year. Over the coming days, we’ll also announce our choices for the full season Hitter, Starting Pitcher and Relief Pitcher of the Year. It is important to note that voters were encouraged to only look at the stats from the GCL Twins and the Elizabethton Twins. That’s probably unfair to the likes of Michael Davis and Michael Helman who played very little in Elizabethton before being promoted to Cedar Rapids where they continued to play well. Ryan Jeffers and Trevor Larnach each stayed in E-Town a little longer. With fewer games than full season leagues, players have less time to make their mark. A smaller sample size can skew a player's overall numbers. However, each of these players are trying to make the organization take notice of their performance. Yesterday, Twins Daily announced the Short Season Pitcher of the Year. Throughout the rest of the week, the other minor league awards will be announced. There were some strong performances throughout the minors and some of these players may be part of the next wave of players heading for Target Field. Severino split the 2017 season between the Dominican Summer League and the Braves Gulf Coast League teams. Following the season, he was ruled a free agent by Major League Baseball and the Twins quickly signed him for $2.5 million. The 18-year-old is a really good athlete with good speed, but he’s also got real good bat speed from both sides of the plate which could lead to some power. While he could play shortstop, he is already primarily playing second base. Burns was the Twins 18th-round pick in 2017 out of UC-Santa Barbara. He’s fought some injuries in his time as a professional, including about a month due to a knee injury this season. When he did play, he displayed some raw power that made him intriguing to the organization. If we’re being honest, Jeffers was clearly on his way to this award, but it was clear that the Twins 2nd-round pick was ready to be pushed to the Midwest League. Jeffers hit for average, he took walks and got on base, and he showed plenty of power. Those things continued after he joined the Cedar Rapids Kernels. Casanova played just one year of high school baseball and then went to three junior colleges before spending a year at El Camino College. He was drafted in 2017 in the 14th round by Seattle, but he chose to go to Cal State-Northridge. The Twins made him their 13th-round pick and sent him as one of four catchers to Elizabethton. He played a little more than half of the time and earned the playing time with his high batting average and doubles power. As he continues to work on his defense, he will be one to watch in Cedar Rapids in 2019. Get to know more about Casanova from his Q&A for Twins Daily. Williams grew up in Southern California and after a strong high school career, he did not have a single Division 1 offer. So, he went to an area junior college and after one year, he moved across the country to play at Clemson University. Over the next three years, Williams played in 211 games for Clemson and hit a combined .276 (.883) with 48 doubles and 44 home runs. He was drafted in the 31st round of the 2017 draft by the Rays but went back for his senior season. This June, the Twins called his name in the eighth round. Since the only defensive position Williams played for Elizabethton was first base, it may surprise many to know that the Twins drafted him as a catcher, and that may be something he gets an opportunity to do starting next month. Williams’ 15 home runs led the Appalachian League, and his 51 RBI put him in fourth in the league. Despite the low batting average, he finished in the Top 10 in the league in slugging percentage and OPS. While he struck out just under 20% of his plate appearances, he walked over 15% of the time too. 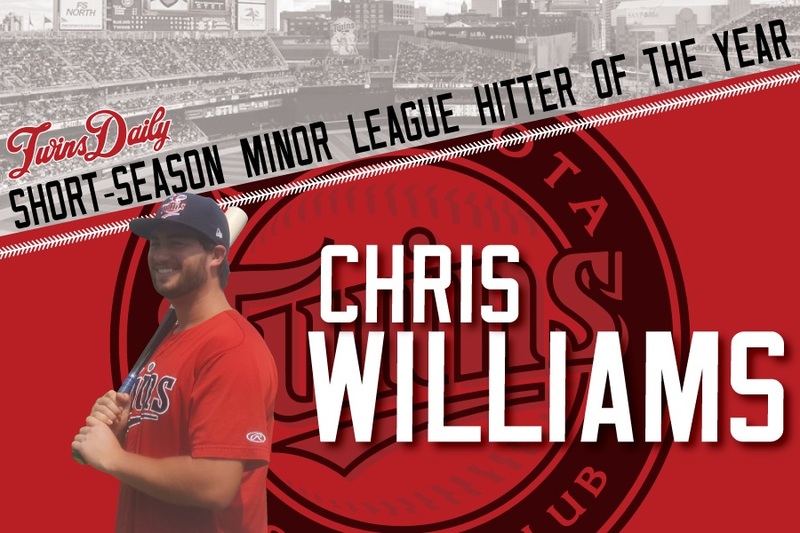 All that being said, Williams had a very nice professional debut with the Elizabethton Twins and was very deserving as the choice for Twins Daily Short-Season Hitter of the Year. Feel free to discuss. What do you think of our rankings? How would you rank them? How would your ballot look? Very close and decent watch list, will see how they develop when most of them go to Cedar Rapids next year. Interesting how Williams and Jeffers were both question marks on draft day.Did the Twins draft both because they could sign them cheap and use the money on others taken in the top 10?We will never know. Three months later, both are pleasant surprises.Do they continue to perform well and make it to the Twins?Only time will tell, although the odds are long.But wasn't it fun watching both of them mash all summer? And I loved the Twins signing Severino, even though it took up nearly half this year's International Pool. To be fair, the questions that there were on draft day with Jeffers and Williams are still there. Both could hit (And this is a hitting award) The question marks for both were more on defense and specifically at catcher. Jeffers did fine defensively and maybe was even better than expected. Williams played 1B, in large part because of the shoulder. Is it usual for short season OPS's to be so low? I notice that even among the Other Receiving Votes, most have OPS below major league average. Noticed throughout the short season that he would go 4, 5 days, even a week at a time without accumulating any stats. I remember reading when he was signed that he had fought the injury bug some at Utah while he was there. Did you hear anything about him being banged up some (I never saw any injury reports during the season) or was the development team trying to ease him into pro-ball perhaps due to his missing time in college? So, the GCL suppresses hitting. Makes some sense given where they play. An average OPS of .692 is well below the major league OPS average, so I guess it makes sense that even the good hitters would seem somewhat low. At one point, he missed about 3 weeks with a quad injury. It's also important to note where these people are in their careers. GCL is in noon games in the July and August heat of southwest Florida. Many in their first pro experiences. Many not getting real consistent playing time. Or, for top prospects, they're playing most every day for the first time ever. There are just so many factors in these leagues. But also important to note... Check out what Jeffers, Larnach, Helman and Davis did in Cedar Rapids after short stints in E-Town. What could they have done with another month of games in E-Town? Williams and Jeffers, two good hitting college catchers. I wish them both well in the future. I wonder how their defensive skills, including arm strength, are?